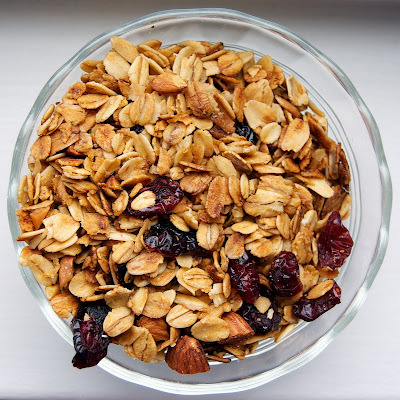 I had wanted to make my own granola for a long time. Heck, the first recipe ever posted on my blog was for homemade granola bars! But as time went on, I still found myself without a jar full of some Ginger Cook Granola (I would totally market that by the way, it has a nice ring to it). A few weeks ago, when I wasn’t feeling that well but still wanted to be in the kitchen, I decided to up and make it. I had oats on hand, natural sweeteners, dried fruit, nuts and all things delicious. I even had some citrus on hand to zest! Now that I’ve made it, I don’t think I’ll ever be able to go back to buying granola from the store. Not only was making it from scratch SO CHEAP (how DO they get off charging us $6 for a tiny bag in the stores? ), but I had SO much and it didn’t take much time at all! Throw together some ingredients, bake, cool down and watch yourself devour every last bit in a few days. I mean, that’s what happened with me but I somehow came down with the death flu and it was the only thing I could manage to eat. And eat it I did! I think the next batch I made I want to have a little bit of a topical feel – toasted coconut, dried mango, dried pineapple and some macadamia nuts. Maybe? In a large bowl, toss together all dry ingredients except cranberries. In a small bowl, combine honey, canola oil, a bit of lemon juice and vanilla extract. Whisk to fully combine. Pour over dry ingredients and toss until thoroughly coated. Divide mixture between cookie sheets, spreading into a thin layer. Bake in preheated oven for 15-20 minutes. Stir around granola, and rotate pans. Bake an additional 10 to 15 minutes, until deep golden brown. Watch carefully, it can burn! Remove from oven and cool completely. Add dried cranberries. Store in an airtight container. Enjoy! 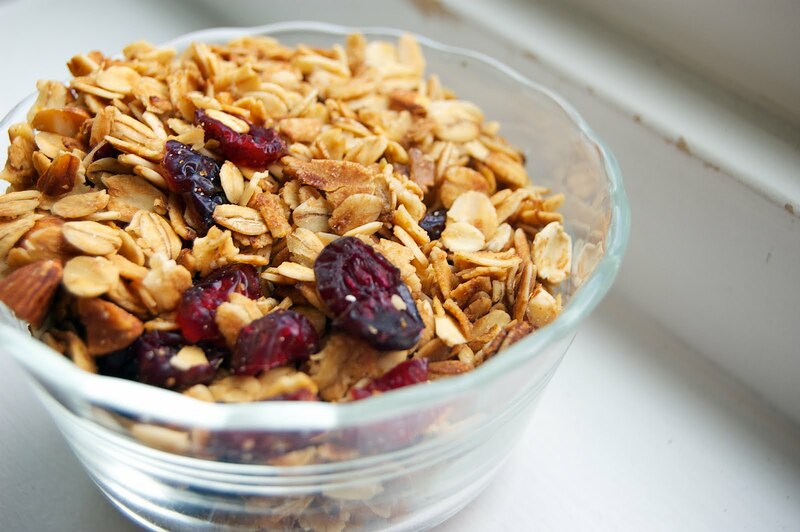 That's some good looking granola you have there. I too am addicted to making my own granola and can never go back to store bought or even farmer's market/bakery bought granola. It's just so good when you make it at home. 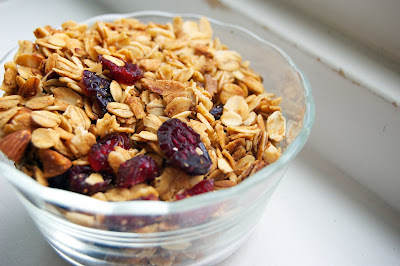 The granola I'm used to making is Alton Brown's recipe and can be found on my blog here. I've been meaning to mix it up and I think I might try your recipe soon. Thank you for sharing! I have some of this in my oven as we speak and I can't wait to try it! I was practically licking the bowl because the raw stuff was tasty in itself!